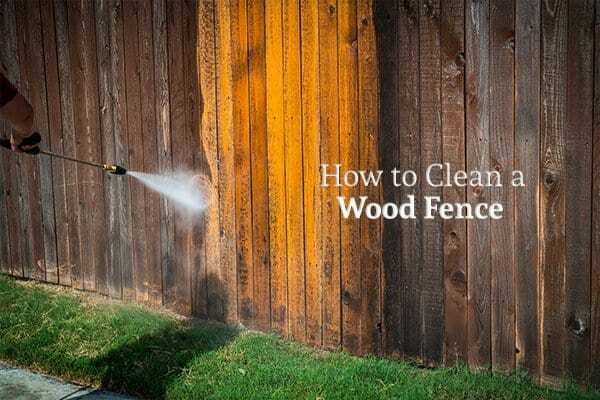 How to Clean a Wood Fence | Rustic Fence Specialists, Inc. There are certain kinds of grime that power washing won’t remove. Some you should scrub off before power washing and some you should remove afterwards. Before you power wash your wood fence, take a wire brush and gently scrub off caked-on grime such as mud. It’s especially important to be gentle when you have a painted fence because the wire brush may damage the paint. You want to prep your wood fence for pressure washing by first spraying down the entire fence with your garden hose. Set the hose to a medium-high pressure to get off some of the surface dirt. It’s important to be careful when pressure washing a wood fence so that you don’t damage it. You want to use a pressure washer with a psi that’s no higher than 1500-2000. In addition, it’s a good idea to add a tip to the pressure washer that will fan out the water. A 25-degree tip is a good choice. To pressure wash your wood fence, you want to stand about 2 feet away from the fence and use long, even strokes. Spray from right to left and keep going until you no longer see dirty runoff coming from the fence. Make sure that you don’t point the power washer at one particular spot for too long. The constant spray of water in a single spot can end up damaging your wooden fence. This is why it’s important to use long strokes to clean your fence. Hand-washing a wooden fence is a good option if you don’t own a pressure washer or you’re concerned about potentially damaging your fence. Here are some simple steps for hand washing a wood fence. The first steps for hand-washing your fence are the same as for pressuring washing: scrub off caked-on gunk like mud with a metal brush and then rinse the fence with a garden hose. After the 15 minutes are up, use a plastic bristle scrub brush to scrub off the dirt. Finally, you’ll want to use your garden hose to rinse the bleach off your wood fence. Mold and algae can damage your wood fence, and even if you remove them, they can leave behind green stains. To remove these growths, make a mixture of one part chlorine bleach and two parts water. Use a plastic bristle brush and this mixture to scrub the mold or algae off your fence. Once you’ve gotten the mold or algae up, rinse off all areas where they were with your garden hose. Like mold and algae, moss and mildew are both damaging and unsightly to your fence. The solution to removing these growths is a bit different, however. To remove moss and mildew, you’ll want to use a mixture of ½ cup vinegar and 1 gallon of water. Apply the mixture to the wood fence with a sponge and let it sit for 15 minutes. After that, you’ll use a plastic bristle brush to scrub off the moss or mildew. And at the end, you’ll rinse off the spots you cleaned with your garden hose. If your wood fence is unsightly enough that even washing it doesn’t help, it may be time for a fence replacement. In that case, call in Rustic Fence to give you a brand new fence. They’ve been providing homeowners in the DFW area with beautiful new fences for over 50 years, and they can do the same for you.